It was a season that promised so much for L’OM. A new manager with a temperament to match the city’s, a young, hungry and talented squad with a point to prove, and as always a fan-base that never shirks their duties in terms of producing an atmosphere. Everything started brilliantly. Somewhere along the line, though, the milk turned sour. To tell us more, here’s French football expert, Mohamed Mohamed. Follow him on Twitter at @MoeSquare. It’s almost impossible to put into words the type of season that Marseille have had this year. It’s been brilliant, maddening, brilliant again, maddening again and something in-between. After the disappointment last season both domestically and in the Champions League, no European football this season was the perfect foil for the flamboyant season that has occurred. It also helped that Marseille hired a mad genius to oversee their resurgence. Marcelo Bielsa is a lot of things as a manager, but he’s never one to have a side that will lack in the entertainment quotient both on and off the field. In his single season with Marseille, he’s had fights with the club president Vincent Labrune, repeatedly mentioned that he has an opt out clause after this season and scorned centre back prospect Doria to the point that he was loaned back to Sao Paulo midseason. Bielsa hadn’t played the Brazilian for a single minute in any competitions and rarely even had him on the bench, often having him play on the Under 21 squad. But it wouldn’t be Bielsa if the team on the pitch didn’t exhibit some of the same crazy tendencies. Simply put, Marseille have arguably been the best attraction in Ligue 1, both for their attacking play and the defensive ineptitude. 2-3 versus Caen, 3-5 versus Lorient, 2-3 versus PSG, 1-6 at Toulouse, 4-0 versus Nice. The amount of crazy games that Marseille have been involved in this season has been staggering. For all the shortcomings (namely stubbornness) that Bielsa has, some of the work he’s done this year on individual players has been outstanding. Even though Andre-Pierre Gignac had a solid rebound season last season, he’s helped the Frenchman return to the grand heights he experienced when he was a Toulouse player, so much so that Gignac got recalled to the French national side in October. Not something many thought would ever happen again. Dimitri Payet has regained the form he exhibited when he was with Lille. He’s created the most chances in Ligue 1 at 127, the next highest is 78 by Walid Mesloub of Lorient. Benjamin Mendy has also grown in confidence and is becoming a more flamboyant attacking wingback, albeit with some defensive issues that need ironing out. Marseille were top of the table through the first 19 weeks this season, winning eight games on the trot at one point during that stretch while playing some of the most exhilarating football you’ll see from a team that isn’t Barcelona. The high tempo pressing – a Bielsa trademark- and lots of quick crossing led to many an early goal. 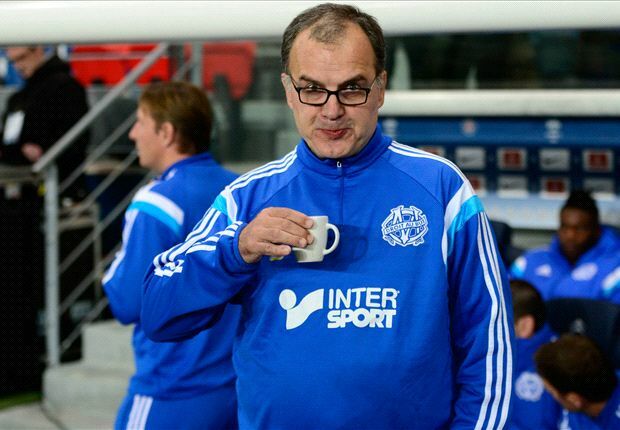 It was the best show in Ligue 1 and Bielsa was a hero to both Marseille fans, and football hipsters alike. It was also a great advert for French football and proved that an exciting style could be sustainable in a league more known for the dour 0-0 draw. And yet as we stand currently, Marseille have gone from title contenders to a club that has missed out on the Champions League places altogether. Some of this was simply due to statistical regression on a team level, and the consequence of that was that the defense became exposed. Marseille’s defense for the majority of the second half of this season has been makeshift. Nicolas Nkoulou’s knee injury knocked him out from January to April which forced Bielsa to play two natural fullbacks in Jeremy Morel and Rod Fanni. Though the two put in an honest day’s work, they’re often overworked given Bielsa’s propensity to have his wingbacks pushing into the opposition final third. The ploy leads to numerous counter-attacks for the opposition with acres of space to exploit. The 2-3 loss versus Caen when Marseille were 2-0 up was a perfect example of this, as was the 3-5 loss to Lorient just a couple of weeks ago. It often leaves Morel and Fanni to cover up the gaps in front of them and they simply cannot do that. What’s made this Marseille season extra confounding is that as recently as April 3rd, they were only two points back from first place, despite the fall in form, but have since declined even further. A combination of tired legs, a lack of pragmatism from Bielsa and other factors have contributed. It is quite something considering that Marseille have only had to deal with Ligue 1 this season and no European football. The future for L’OM looks very uncertain. There’s a good chance that Marcelo Bielsa will not come back to fulfill his second season which means Marseille will look for their fourth manager in three years. It has never been a club known for manager stability so it’ll be interesting to see who the replacement will be. There is also likely to be a mass exodus of players this summer including Andre Ayew and Andre-Pierre Gignac on free transfers, and without Champions League football next season, it’ll be hard to reinforce the squad enough to deal with the Europa League (a competition that Ligue 1 teams have done terribly in over the past 6-7 years) and Ligue 1. If you’d have asked OM fans if they would have been satisfied with being in the hunt for third place going into the final day of the season, they probably would’ve said yes. But the way that Marseille’s season has devolved from a possible title favorite to missing out on third has been bitterly disappointing. Some of the most vibrant attacking football this season in Ligue 1 has been played in the Stade Veledrome, but OM fans have been left to think more about the what-ifs and if-onlys rather than the joy and excitement that the early part of the season promised.